FRIDAY, APR. 1: A slew of defendants facing firearms charges appeared in Supreme Court this morning for the monthly arraignment session. 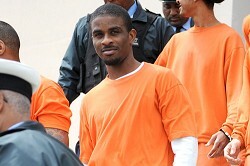 Noet Alexander Barnett, 22, pleaded not guilty to attempting to murder Jeremiah Dill on October 4, 2010. He also denied using a firearm while committing an indictable offence, namely attempted murder. Mr. Barnett pleaded not guilty to handling a firearm, a Rexio RJ Serie .38 spl revolver, between 0ctober 4 and December 22, 2010. He was remanded into custody until his trial on July 11. Kofi Dill, 31, and Thayja Simons, 22, pleaded not guilty to knowingly handling a firearm, a .3 caliber revolver, without lawful authority. The pair was also denied knowingly concealing ammunition, namely a .3 caliber cartridge, without lawful authority. The incident occurred on or about December 22, 2010 in Pembroke. They will face trial on August 22. Curtis Mallory, 20, pleaded guilty to robbing Jason DeMello of cash on January 2 in Smith’s and brandishing a firearm. He denied attempting to rob Alex Travasso of money on January 4 and brandishing a firearm in Smith’s. Crown Counsel Carrington Mahoney accepted the pleas and asked for the not guilty pleas to lie on file. The matter was adjourned until the next arraignment session and Mr. Mallory was remanded into custody. Leo Dendre Burgess, 17, pleaded not guilty to breaking into a South Road, Southampton home with a firearm and stealing jewelry and cash on December 6 with persons not before the courts. He also pleaded not guilty to handling a firearm on December 6, 2010. Mr. Burgess’ matter will be mentioned in June. Meanwhile, Tashon Alvin Bean, 22, pleaded guilty to robbing Gary Wilson of a money bag containing $50,000 belonging to the Government on November 12 last year. It is alleged he acted with others not before the courts. Puisne Judge Carlisle Greaves ordered a social inquiry report and adjourned the matter until the next arraignment session. Mr. Bean was remanded into custody. Cedric Oates, 40, denied tricking Dianne Laird into investing $345,000, knowing that he was misleading her. He was bailed until his trial on June 20. Mary Darnell Johnson, 52, pleaded not guilty to conspiring with persons in Bermuda and elsewhere to import the controlled drug cannabis into Bermuda between a date unknown and October 21, 2010. She was bailed and will reappear at the next arraignment session.